The Office of Fiscal Analysis pegs the cost of increasing the minimum wage to $15 per hour and implementing a paid family medical leave program at nearly $80 million, as the state faces projected budget deficits. There are two bills raising the minimum wage to $15 per hour, which differ slightly in how they phase in the increase, but the cost to the state is estimated at approximately $40 million by 2022 or 2023. Various Connecticut state agencies contract with private providers to provide services and many of those employees receive less than $15 per hour. The state also has a collective bargaining agreement with family child care providers through the Office of Early Childhood and the Care4Kids program, which raises the cost to the state by $7.1 million. The minimum wage increase will also increase costs to municipalities, ranging from $50,000 per year for a town with less than 20,000 residents to $1 million per year for a city. Various businesses and business organizations have pushed back against the minimum wage increase saying it will be too large of a cost increase and possibly lead to reduced hours or worker layoffs. The report by OFA notes that raising the minimum wage will reduce the number of hours that recipients of state assistance can work before losing their benefits. At $15 per hour, a single adult without dependents would only be able to work 23 hours per week and still maintain their HUSKY Medicaid benefits, while a parent would only be able to work 36 hours per week before losing benefits. The paid Family Medical Leave Program proposed by both House and Senate Democrats would be funded with a $20 million bond for start-up costs for hiring additional staff at the Department of Labor and will require on-going costs of $18 million per year. The bond would cost $30 million over the life of the loan. OFA wrote their estimates are based on the cost for handling all current FMLA inquiries and investigations under the federal FMLA law, however the state program would greatly expand the number of covered employees. Currently, federal FMLA law covers 2,900 employers with 890,000 employees. The state paid FMLA program would expand coverage to 103,600 employers with 1.4 million employees. The paid FMLA program would be funded through a .5 percent payroll tax on employees, which would enable the employee to collect up to $1,000 per week for 12 weeks every year to attend to a personal or family medical issue. Although most state and municipal employees would be excluded from participation, state and municipal employee unions can bargain into the program which has the potential to increase the number of workers eligible to use the time and increase costs for both the state and municipalities. While the federal FMLA program limits coverage to companies with 75 or more employees, the state paid FMLA program would extend coverage to any company with one or more employees. Businesses and business organizations have also been outspoken at the Capitol opposing the measure noting the payroll tax will likely not be enough to fund the program and that their costs will increase as they try to find temporary workers to fill in while the employee is taking their leave time. 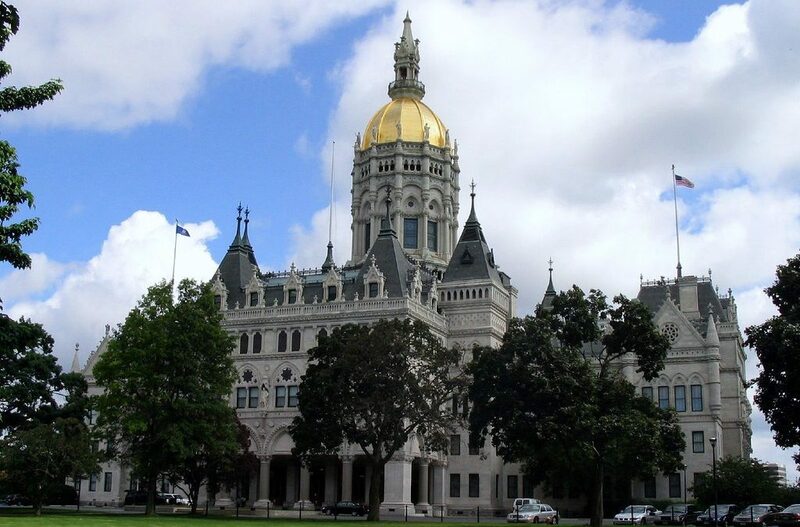 Connecticut lawmakers are currently trying to fix a $3.7 billion budget gap. Gov. Lamont has proposed expanding the sales tax to include numerous different services and implementing a tax on sugar-sweetened beverages and plastic grocery bags, as well as extending a tax on hospitals. All three bills have passed out of the Labor and Public Employees Committee and are high-priority legislation for Democrats in the House and Senate, as well as Lamont who included the proposals in his budget. This legislation has all the earmarks of people who have never had to meet a payroll. Do they think that folks making $15/hour now will be satisfied or will they want higher wages. Businesses will just reduce their workforce or throw up their hands and go out of business. Family leave…. who does the work of the person on leave, and what happens to the replacement when the person comes back from leave? Can a person take the last 12 weeks of the year off and combine it with the first 12 weeks of the next year for a total of 6 months? As for new businesses coming into the state… they’d need their heads examined. Some quick math: $1000.00 per week multiplied by 12 weeks= $12,000.00 per year per employee. Assuming state and local governments do not lump their employees into the pool, one-million four-hundred thousand employees are eligible. Sixteen billion eight-hundred million dollars per year. That 0.5% ain’t gonna do it.